Is there anything Drake can’t perfect? We’ve been hanging onto this one line since Drake confirmed that it was the name of his album in 2014. Since then, he has released If You’re Reading This It’s Too Late and What a Time To Be Alive alongside Future. What I loved most about waiting for VIEWS, is the way that Drake released everything little by little. He manually built up the anticipation. And he left a lot to the imagination along the way. As dreadful as it is to wait so long, it kept fans wanting more. By waiting that long we know that it will be of quality (As all of his work is). Drake has a way of putting his magic touch on everything he does. 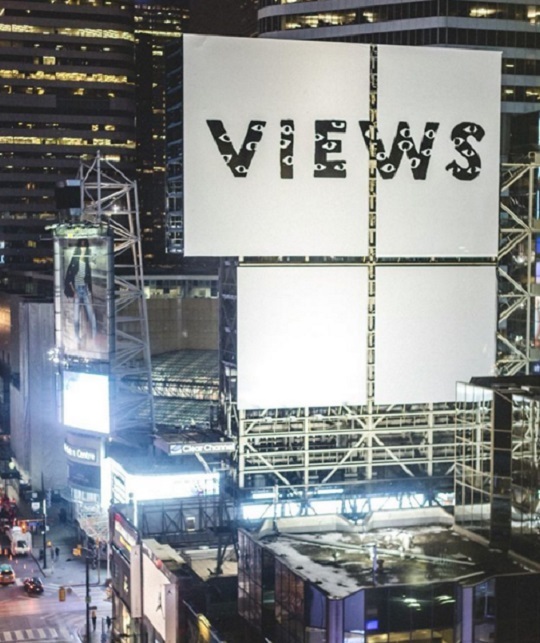 I really admired his branding for VIEWS. From the name all the way down to the look and feel, I think that he nailed it. Even though the name changed, he still stuck with Toronto. The ads and the cover both revolve around his hometown. With a quick glance at these ads, you can tell that they follow the trend of Drake’s minimalist vibes. This works for Drake, and it works for the location. Torontonians know Drake. They don’t have to pull their phones out and Google “what is this views billboard for in toronto?” because they have already heard about it. Whether they follow Drake or not, they have at least minimal knowledge of what is going on. The vibe this campaign gives off is so eerie in the most interesting way. Since it is so minimalist, there is not much explanation. So it’s left up to us, to interpret what it all means. And if there’s one thing people love doing, it’s speculating. This is my absolute favourite ad out of all of them. It reads “The 6 [god] is watching”. This goes on my list of things that I wish I had written. Out of all of the ads, this is the one that brings the most emotion for me. It almost makes you feel like there really is someone watching you. And it’s not in a “guardian angel” type of way. It’s in a “watch your back” type of way. And maybe that’s why he chose to release Summer Sixteen. Maybe it was meant to coincide with the advertising. This ad is another one of my favourites. Mostly for the same reasons as above, but I also like that the album name is included in this one. The eyes are what gives it the same eerie feel. It works extremely well with the other ad. Onto the album cover. One of the last pieces to be revealed. Also one of my favourite pieces in the whole campaign. 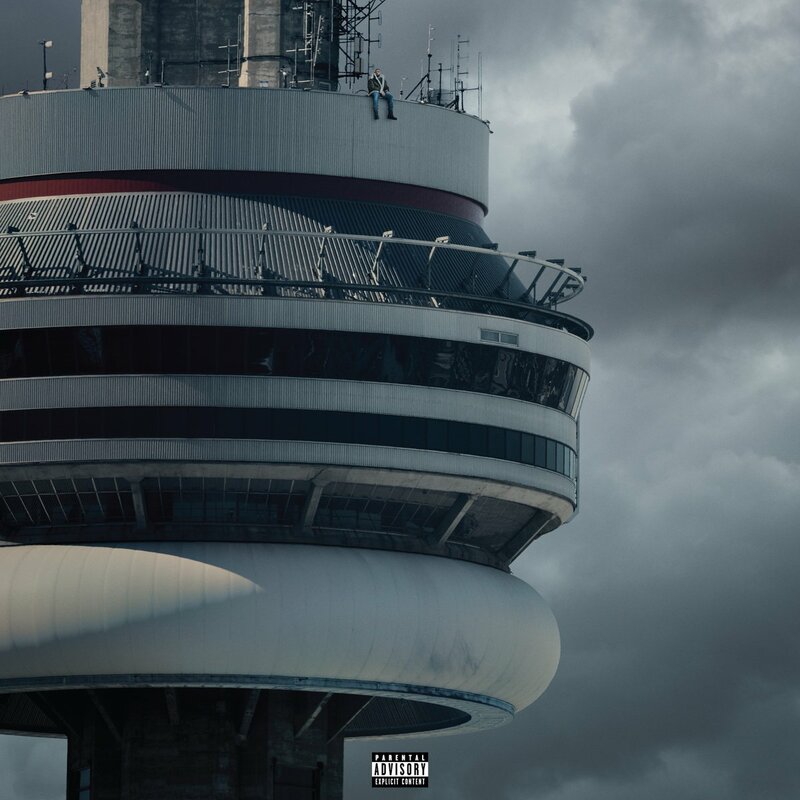 Drake, almost acting like the guardian angel of the 6, sits atop one of the most recognized symbols in Toronto – the CN Tower. 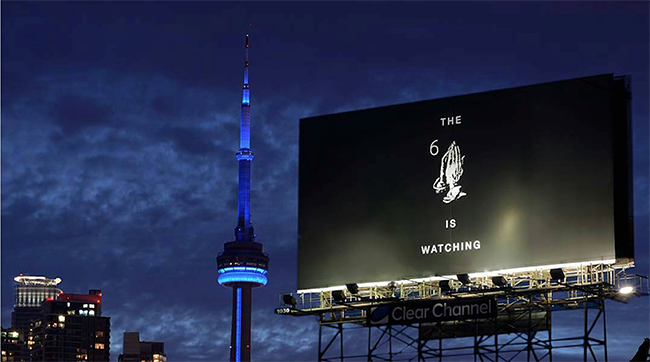 Here, he has the best view of the 6. It seems to symbolize that he’s always watching (As the first ad states), and that he’ll be there whenever his city needs him in true vigilante fashion. The Views trailers, (one of which was released today) seal the whole thing together. I love the way that the first trailer is put together. The combination of spoken words and clips works so well together. And it tells a story. A story that doesn’t make any sense now, but likely will once Views drops. And the second trailer is more mellow, but at the very end becomes more upbeat. Every time I see a piece from this campaign I feel anticipation. And I get the feeling of a “Big Brother” watching over me. It’s the same feeling that I get when I am watching an episode of Arrow, and I am anticipating what will come next. At the same time feeling like there is something totally different going on than what I think is happening. Something behind the scenes. I wish that more musicians would take this approach with their album advertising. I don’t think there has ever been a campaign that I loved more than this. I love a lot of campaigns but this one really stood out for me. No other campaign has ever had me this excited for an album. I know that Drake will pull off the music when we finally get to hear the finished product tomorrow. I don’t know about you, but I’ll be staying tuned to Views.